Saffron cultivation is facing decline in Kashmir. Credit: Sana Altaf/IPS. SRINAGAR, Dec 8 2011 (IPS) - The saffron and silk industries in Kashmir have been dying a silent death over the last decade, with production rates for both commodities witnessing up to 50 percent declines in some areas of the Kashmir Valley. A growing market for cheap, ‘fake’ saffron – either chemically manufactured or ‘cut’ with additives to increase its weight – has dealt a harsh blow to traditional, world renowned saffron producers and sellers in Kashmir. Meanwhile, a mismanaged government monopoly over the silk industry coupled with an invasion of cheap Chinese silk has choked local production, pushing thousands of producers out of business. As a result, Saffron farmers and silk rearers are facing hard times in the lush Kashmir Valley. Official figures estimate that the production of saffron has declined from 16 to 6.5 tonnes in the last year alone, accounting for a more than 60 percent decrease in just 12 months. Land under saffron cultivation has shrunk rapidly, from 5,707 hectares in 1997-98 to just 3,010 hectares in the 2006-2007 financial year. Likewise, production of silk cocoons has plummeted from 1.5 million kilograms (kg) in the 1960s to just over 800,000 kg in 2011, cutting the output of raw silk from 170 to 107 metric tons. Kashmir is one of a handful of places on this earth that grows natural saffron, along with Iran and Spain, and has long been considered to have the best quality saffron in the world, with rich crop plantations in Pampore, Pulwama, Budgam and Kishtiwar. But Saleem Shakeel Mir, managing director of Kashmir Kesar Leader, Kashmir’s leading saffron producer, told IPS that the influx of false saffron has lacerated the market for honest producers. “Chemically-altered and synthetic products are being sold for a fraction of the price of organic Kashmiri saffron, both within and outside the Valley,” he said. Since laymen are unable to differentiate between pure and artificial saffron, the cheaper product is selling fast, Mir added. Mir also blames saffron growers’ hardships and waning cultivation on the rampant industrialisation in the valley, including the proliferation of residential houses in the area, which eats up swathes of land that could otherwise be used for crops. “A decade ago, 10 kanals of land (that is, just over 6,000 square yards) were under saffron cultivation; today just four kanals, less than half the original amount, are used,” Saleem said. Abdul Gaffar, a saffron grower from Pampore said that fake saffron has forced farmers to give up their decades’ old practice. “With the filth that’s entering the market, there is no place for original saffron. We spend thousands of rupees on cultivating saffron and get almost nothing in return,” said Gaffar. Gaffar has seen his area of saffron cultivation shrivel by 60 percent. “If this situation remains unchanged, I might have to abandon cultivation altogether like many others have done,” Gaffar told IPS. 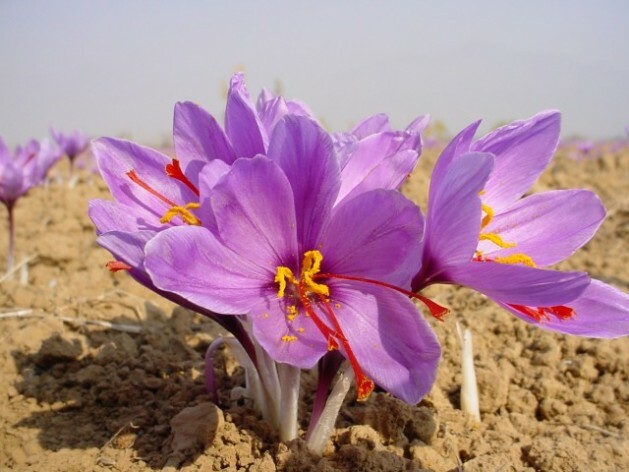 In an effort to combat the crisis, the government recently announced the National Mission on Saffron for Economic Revival, its latest five-year plan aimed at increasing saffron production from 2.32 to five kg per hectare. According to Malik Farooq, director of the Sericulture Department of State, government efforts to save the silk industry have gained much less ground, possibly because a decades-long government monopoly over the silk industry contributed to its decline in the first place. Silk is one of Kashmir’s oldest trades. In 1855, Europe was Kashmir’s biggest silk trading partner, purchasing 70 kg of silkworm seeds every year. The period immediately following the end of British rule opened a glorious phase for Kashmiri silk. “After the1980’s there was a sudden decline in silk production and the industry began to suffer,” Farooq told IPS. The rigid state monopoly that had once boosted the industry became its greatest impediment. The government bought all the silk cocoons from the locals but managed every other stage of the production process themselves. “However, this did not prove to be very profitable,” said Farooq. According to official government statistics, the number of silkworm rearers shrank from 60,000 in 1947 to a mere 7,161 in 1995. The area of land under mulberry cultivation shriveled from thousands of hectares in the early 1900s to less than 2,000 hectares in 1990. From employing 1830 labourers on 584 silk production units, the silk industry now only has the capacity for 200 workers on 30 silk production units. Furthermore, “the invasion of Chinese silk in the market and the lack of government policy or proper protections for domestic producers has practically killed our local industry,” Shafat Ahmad, a silk rearer by trade, told IPS, adding that it is practically impossible to compete with China’s low prices. Farooq believes the government should compensate silk rearers for their losses in order to keep the local industry alive. As it is, many silk producers are abandoning the trade altogether since they are unable to make ends meet. According to the Sericulture Department’s report, ‘Recent Trends in Development of Bivoltine Sericulture in Jammu and Kashmir’, silk rearers also have to contend with other agricultural crops, market shocks and volatility, the dumping of cheap bivoltine silk on the local market and a lack of government development funds.